Nathan P. Gilmour , 4 February 2015. At this point I’m not posting things before the meetings or even the day of the meetings but catching up from missed meetings. Mea culpa. For those just joining us, this series follows the Emmanuel College Christian Humanist reading group for the 2014-2015 school year as we read together through Ludwig Wittgenstein’s Philosophical Investigations. Citations of Wittgenstein in the post will point to section numbers rather than page numbers. Wittgenstein’s concern in this section is with connections between behaviors, memories, and what counts as mental processes. 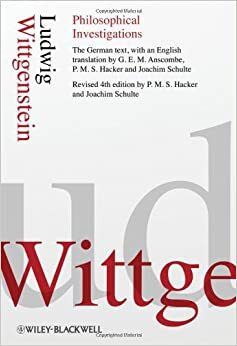 As has been the case in previous sections, Wittgenstein points to assumptions that our language carries in its grammar more than in its arguments, and the phrase “from my mind” comes under investigation here. One of Wittgenstein’s more intelligible examples involves the common moment in which we witness another person cry out or laugh. In “normal cases” (142), we don’t even pause to think about connections between people’s observed responses and anything unseeen going on “inside” the mind of the responder: most of us can identify a cry of pain, a response to an amusing but socially inappropriate joke, and so on: we fool ourselves, philosophically, when we start to believe that the abnormal cases, such as self-delusion or neighbor-deception, govern all cases. The person pretending to be amused at the boss’s joke is a variation on the person simply amused, not vice versa. Likewise “there is no sharp distinction between a random and a systematic mistake” (143). Instead, any given account of a mistake or a laugh or any other observable human phenomenon might or might not be mistaken. There’s no clear and universal rule governing all phenomena that we call mistakes and emotional reactions (145). The problem of knowledge, then, is a logical one as much as one of limited human perception. Thus to know something is neither merely to know its shorthand formulas (153) nor an occurrence of right usage (154) but something that doesn’t quite fit either of those categories. The point here is not to say that reading is nothing or that brain activity doesn’t happen but to note that “reading” and “mental activity,” like “emotional response” and “knowledge,” all have the imprecision that goes along with all metaphors. Like the rest of the metaphors we use on a daily basis, we have no trouble using them and living within them, but conventions of use should not deceive us into assuming that we can reach a precision that actual, living language does not afford. We cannot reduce “reading” to the simple coincidence of looking at printed marks and uttering words (165). Nor can we say that reading consists of sounds that “come” from printed marks, as fanciful and non-alphabetic marks, if we allow them, can “cause” us to imagine sounds (166). Yet we know the difference between reading and looking at a sequence of marks that we do not recognize as language (169). Ultimately, as this section leads into the next post’s concerns, Wittgenstein points to difference as the mark of knowledge (170). When we read, something happens that differs from looking at an animal’s trail on soft ground or a grid of differently-colored squares or a sequence of non-alphabetic scribbles. That notion of difference will roll into the next section as Wittgenstein considers what we mean when we say that objects have essential qualities and that human beings act according to or against custom.